Mogadishu – (warsoor) – The Special Representative of the Chairperson of the African Union Commission (SRCC) for Somalia, Ambassador Francisco Madeira, has called for urgent and timely support for Somali National Security Forces (SNSF) as the African Union begins to scale down its troops. 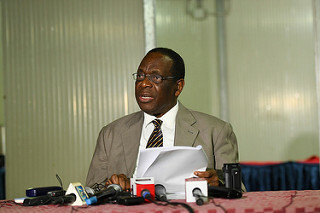 Speaking at a media briefing held in Mogadishu, the SRCC noted that timely and well-coordinated support is necessary to consolidate the gains already made in the country and enable SNSF assume full responsibility for the country’s security, once the African Union Mission in Somalia (AMISOM) exits. “We must reiterate, however, the urgency for timely support for the Somali National Security Forces. The forces urgently need to be equipped with necessary weapons, key logistical support including timely payment of stipends, provision of quality medical care, establishment of key infrastructure including barracks and training centers among others,” SRCC Madeira who is also Head of Mission stated.